Please mark your calendar to attend a meeting for ALL 2019 participants on Thursday, April 11 at 7 PM. We will be distributing MAPS, LAWN SIGNS, POSTERS and POSTCARDS. They are BEAUTIFUL, and they are essential for promoting the Tour AND your participation in it! This meeting is the ONLY point of distribution for these items, so you must attend or send someone to pick up your materials. If you are the contact person for a group venue, please forward this email to all of those in your group. Dvoor Farm is just off the Route 12 circle and we’ll be meeting in the large stone farmhouse close to the road. Please enter through the BACKDOOR. 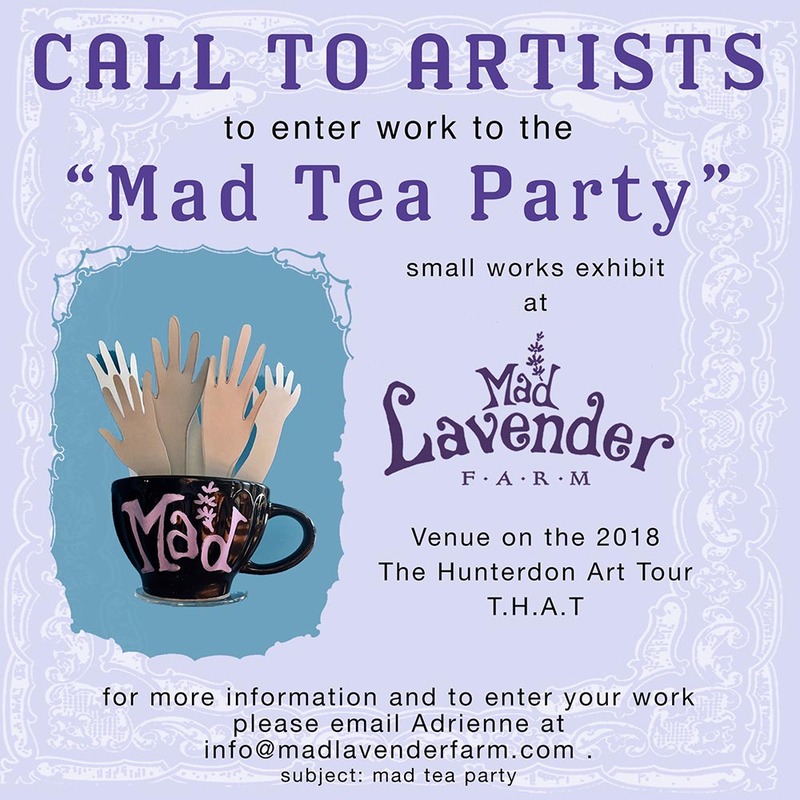 IMPORTANT information about artwork to be exhibited at the Hunterdon Art Museum: because of the large number of artists participating this year, there is a SIZE LIMITATION: your work must not be wider than 30 inches. Do not bring work that is wider than 30 inches, it will not be accepted. Your HAM Loan Agreement is due by April 15. The HAM Loan Agreement can be downloaded here. It is the first document at the top of the list. You can email it to Catherine at<jcathsutt@icloud.com> or hand it in at the meeting on Thursday, April 11. The 2019 THAT postcards are here! They’re big (6″ x 8″) and they look terrific! If you are the point of contact for a group venue, please contact your fellow artists. The 2019 Tour has a stellar roster of 70+ artists participating at more than 30 locations! It is an exciting mix of individual studios and group exhibitions, including new partnerships with Mount Salem Vineyards in Pittstown and Whittemore CCC in Oldwick. 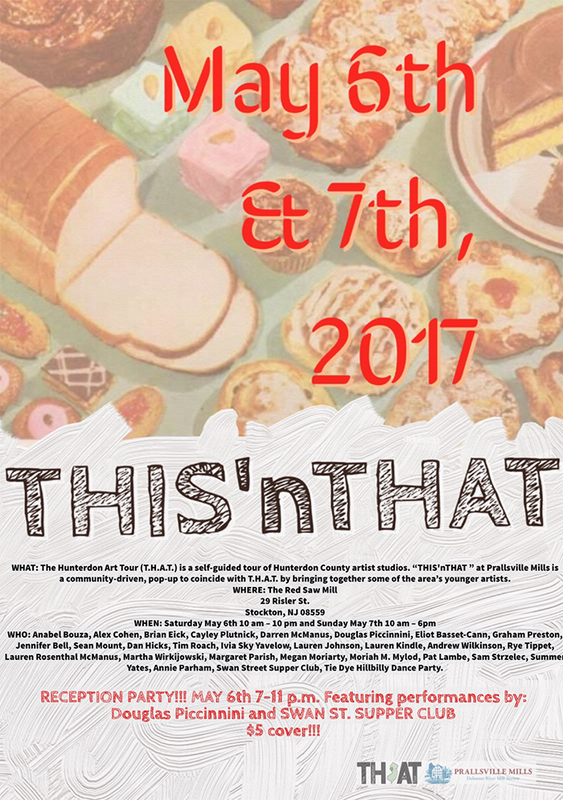 We also are thrilled – for the first time – to highlight the work of several Hunterdon County art teachers as part of the exhibit at HAM. As we strive to build connections in each of the county’s 26 municipalities, we are especially pleased to see a growing presence in the Califon/Lebanon/Tewksbury area. Artists must apply through the Artist Application. We are using CaFÉ™. We just learned that there was a technical problem with the February 1 e-blast sent out by CAFE. They kindly offered to resend the message to compensate for this problem. Because there was some concern about who may or may not have received the CaFE notification, we extended the hard deadline to Friday Feb 22nd. WE are STRONGLY encouraging people to complete their applications by FEB 15th so that we have enough time to prepare the map, design print ads and format web pages. We appreciate your understanding and very much look forward to receiving your registration! CaFÉ™ will be so much easier for you to use. It is the current industry standard. CaFÉ™ is mobile ready. Application information also is posted HERE for your convenience. 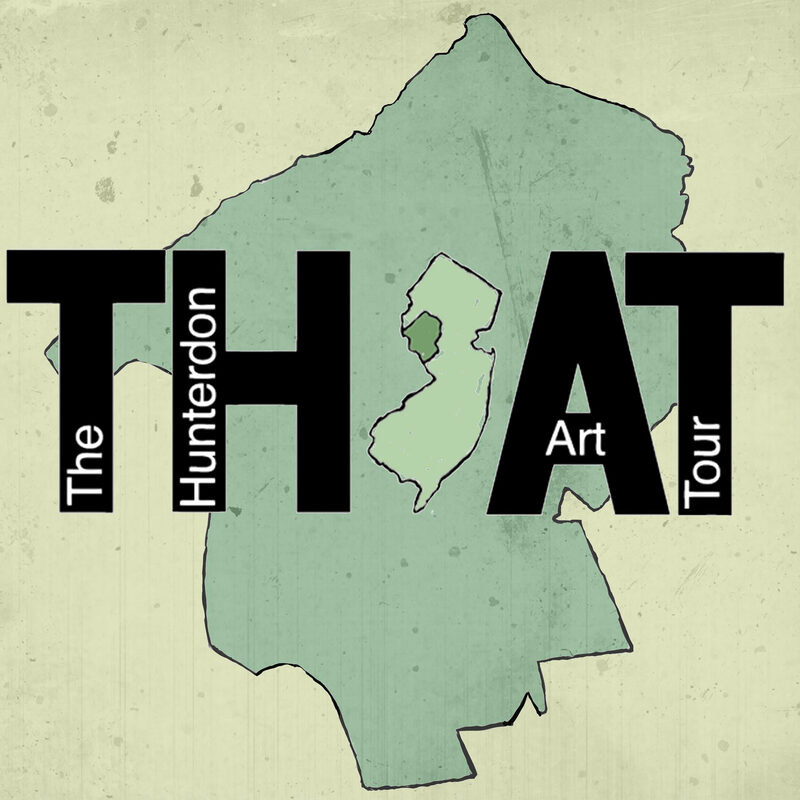 Amazingly, the charity beneficiary for the February Pop-Up-Choir will be THAT – The Hunterdon Art Tour. WOW! 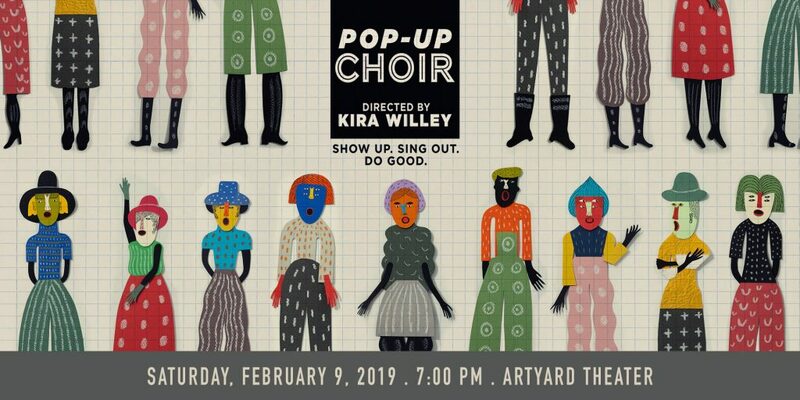 Come and sing and support Artyard, Kira Wiley, and THAT! Next Monday, January 14th, we’ll be gathering to reconnect, share news and answer your questions re THAT 2019. There is a small parking lot directly across the street. There is also a large parking lot next to the CITGO gas station, two blocks away. Machieneart is a commercial building on the west side of Harrison, between 2nd St. and 3rd St.
Special thanks to Leigh Marino for hosting THAT in conjunction with a meeting of Hunterdon County’s Creative Team. All are welcome and we anticipate seeing friends both old and new as we plan this year’s THAT. 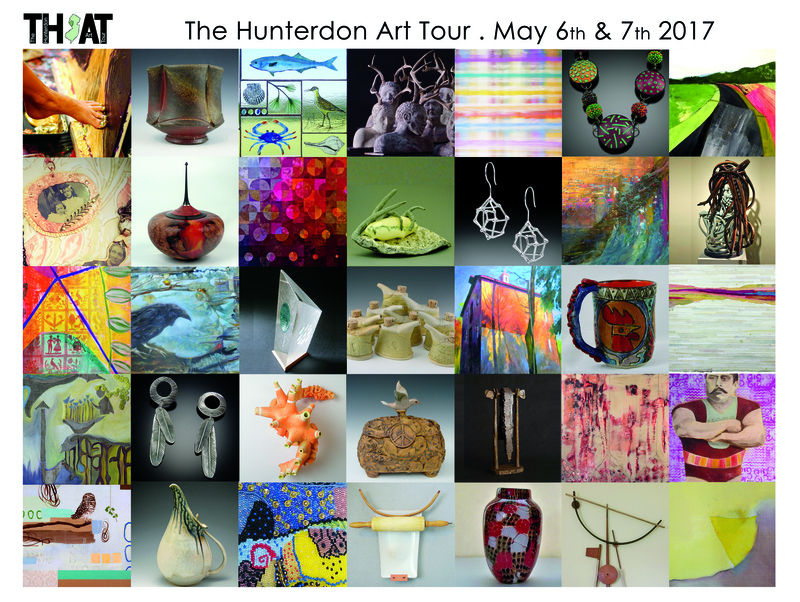 As a reminder registration for The Hunterdon Art Tour (THAT) is now open. Registration closes on February 15, 2019. Registration for THAT is now on CaFÉ, a portal for artists and art events. We think you’ll find this an easier means to register. See you this coming Monday! It will help to know in advance if you’re coming by using this link. Registration for 2019 THAT is OPEN! 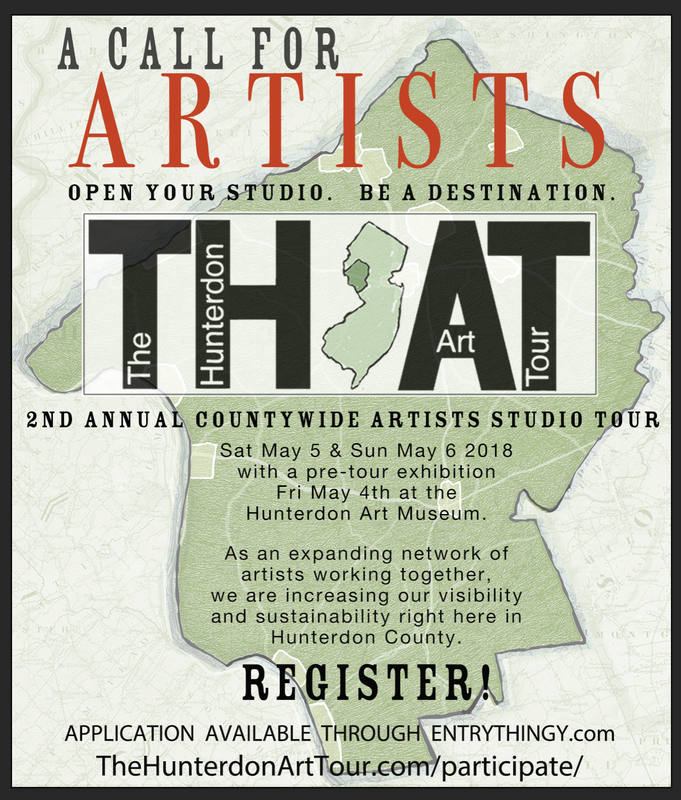 Registration for The Hunterdon Art Tour (THAT) is now open. Registration for THAT is now on CaFÉ, a portal for artists and art events. We think you’ll find this an easier means to register. You can register by going here and following the prompts. 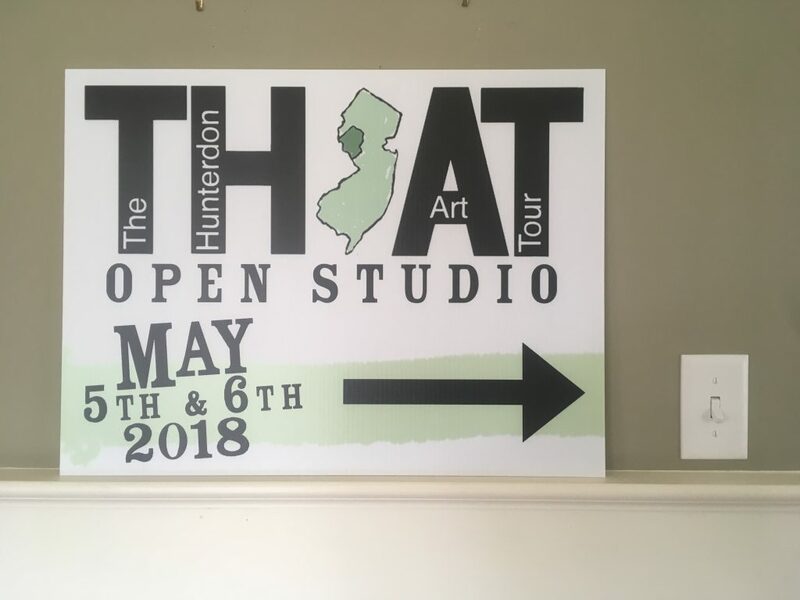 The Hunterdon Art Tour (THAT) is an annual self-guided driving tour of Hunterdon County, NJ artist’s studios. The Tour will be on Saturday, May 4th and Sunday, May 5th from 10 AM to 6 PM each day. It includes an exhibition, sale and reception at the Hunterdon Art Museum in Clinton, NJ on Friday, May 3rd from 7 – 9 PM. The fee for an individual artist is $125; a group venue is $250. 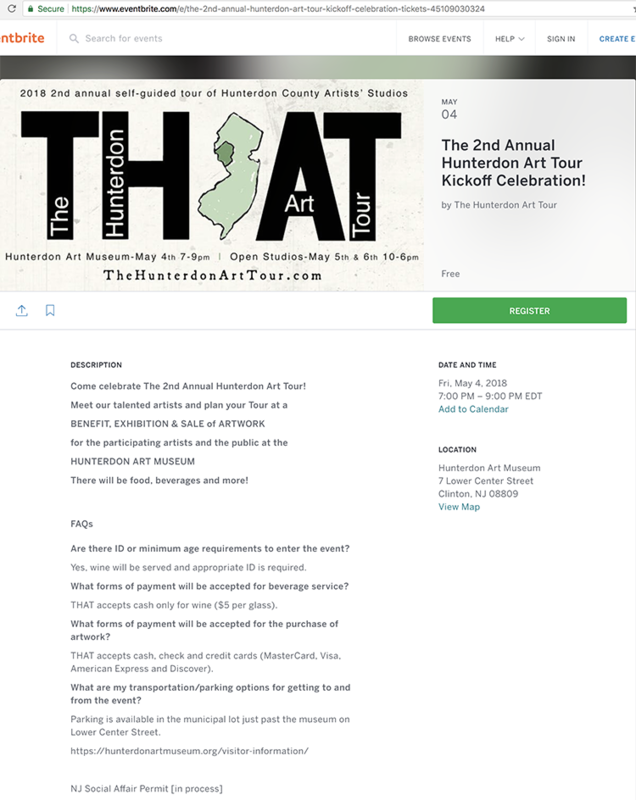 As an individual artist, your studio will be shown on both online and printed maps designed to facilitate the Tour to visitors; you will have your own artist’s page on THAT’s website and the option of participating in the Hunterdon Art Museum exhibition and sale. Artists may enter as a group venue, a more economical way to participate if multiple artists choose to exhibit together at one location. Group venues are shown on both online and printed maps and have a page on THAT’s website. 2019 Artist Application is NOW OPEN! Simply click on the images to find our about each artist. To navigate the participants alphabetically, use the DIRECTORY. CLICK HERE TO REGISTER for Friday night’s Gala with EVENTBRITE. It’s free and fast and helps us a lot! Here-ye! ANNOUNCING the ARTIST MEETING!!! Please proof read your page! New INFO about showing with other artists AT ONE LOCATION. In this way you get to show your work with other artists; have your work featured on its own web page; and as a DESTINATION with muliple artists you might increase traffic during THAT. The deadline to register is March 15th. Meeting this deadline insures that your studio or destination will appear on the printed map and we’ll have enough time to create your webpage. 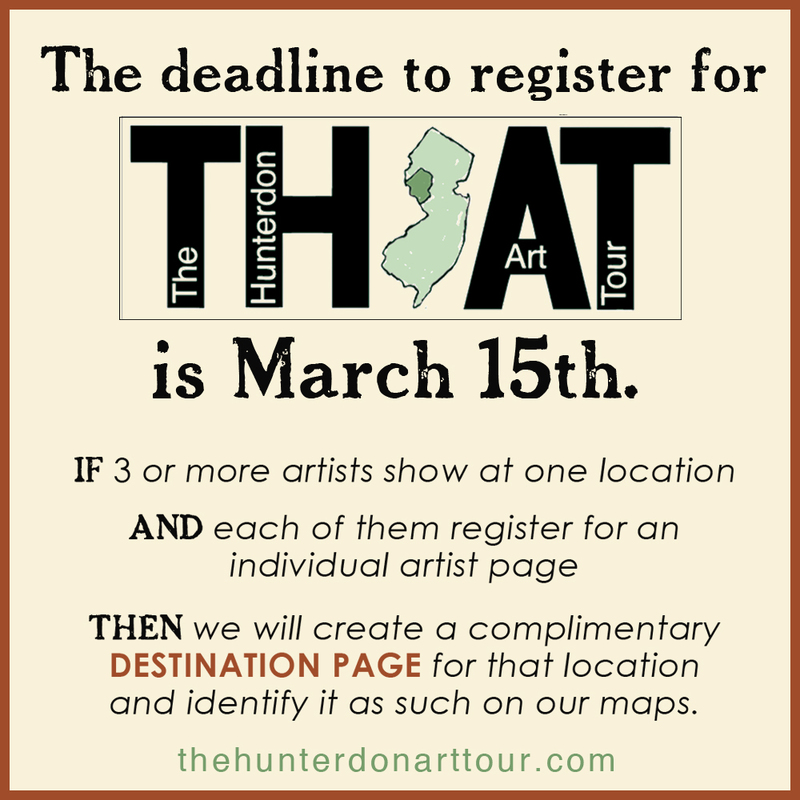 If you need to refresh your understanding of the details to participate, go here: http://thehunterdonarttour.com/participate/ If want to head straight for Entrythingy, to register, go here: http://www.entrythingy.com/d=thehunterdonarttour.com. REMINDER: APPLICATION CLOSES MARCH 15! THAT’s Artist & Destination Application is CLOSING as of MARCH 15. To be included on the printed map – you MUST be registered by MARCH 15! HAPPENING AGAIN THIS SPRING 2018! GET INVOLVED!!! The Hunterdon Art Museum will again graciously host the group exhibition Gala event on Friday, May 4th. 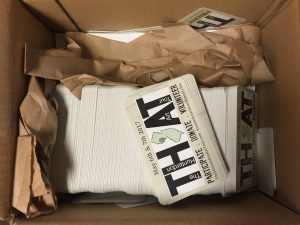 THAT has received a grant from The Hunterdon County Cultural and Heritage Commission for 2018. ICON magazine presented THAT with a cash award for our work in 2017 and to help us move forward in 2018. DIY, in Flemington is becoming a vital partner in our efforts. 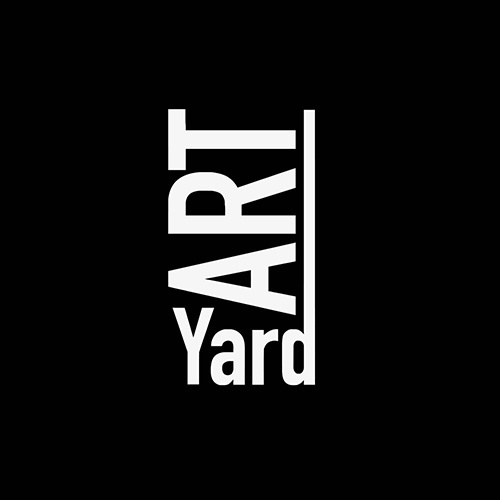 ARTYARD is our 2018 matching partner for HCCHC’s grant. We have begun fundraising for 2018. We had our first very well attended Artist Meeting at DIY in Flemington on Thursday evening Dec 7th at 7PM. Get Found – Get Listed! 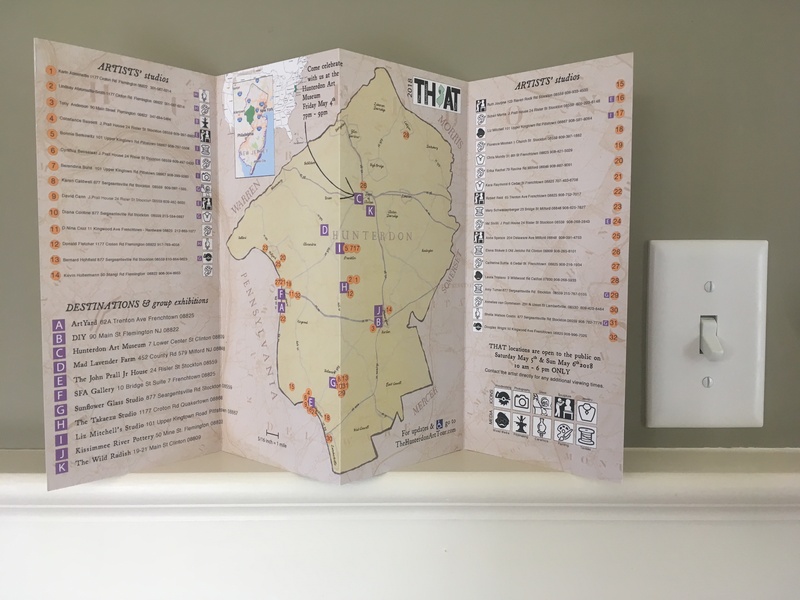 Get on the Hunterdon County Creative Assets Inventory! 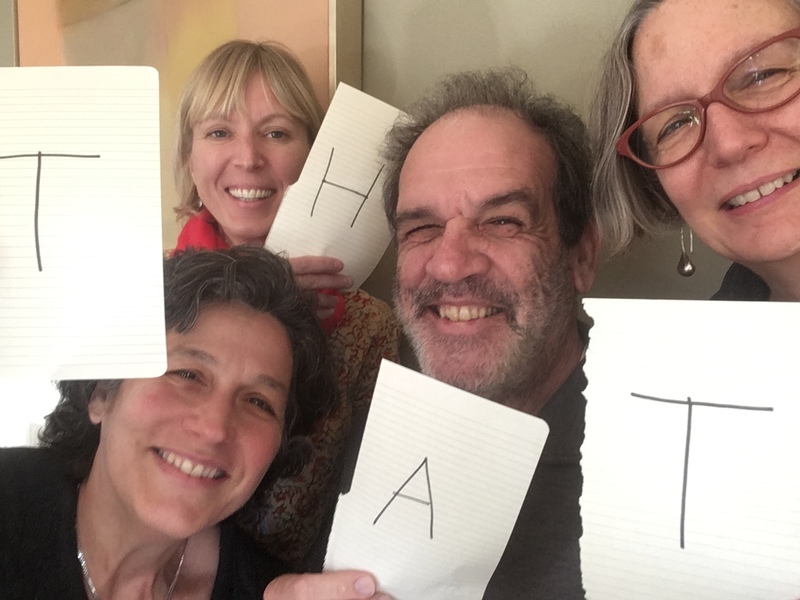 Sustainable Frenchtown and the Hunterdon County Creative Team are conducting an inventory of all things creative in and around the Frenchtown area. Knowing what we have, who we are, and where we work and play is the first step in building a creative network. The success of this project depends on YOU! A comprehensive inventory of our assets is the first step to advancing and developing the arts in our area. Add your assets, spread the word, and get involved! Contact us at creativeteam.assets@gmail.com. go to : http://www.creativehunterdon.org/survey.html And choose a category . Help us build this thing. Help us build our community. T.H.A.T. 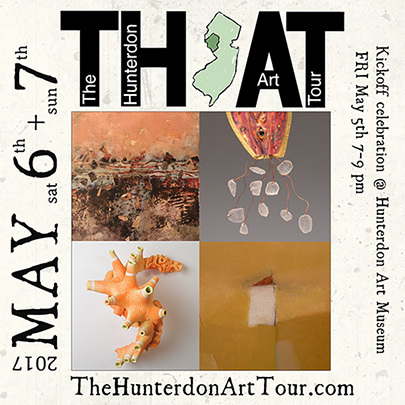 , The Hunterdon Art Tour completed its first year triumphantly! It seems that most of the visitors to our studios this year were other artists. At first this worried me, but I quickly realized how great that actually is. As we create a stronger community, as we become cohesive, when we are able to easily work together and form critique groups, curate exhibitions, hold workshops, share ideas then we will be able to share our process, we will be able to show our work with greater relevance to our community. Once we are able to do that, as well we become a stronger force. Like those DownTown artists in the 1950’s and 60’s, we here in Hunterdon County are finding each other. We are expanding our community. From”Inventing Downtown” – I saw this photograph and laughed! It was taken by my undergraduate drawing professor from SUNY Purchase – John Cohen. It reminded me of how small the art world really is. 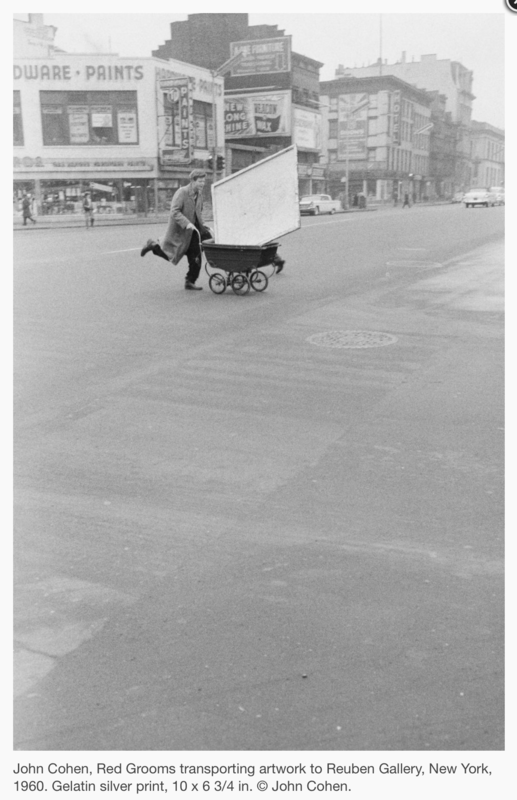 Very recently, The Grey Art Gallery at NYU held an exhibition called “Inventing Downtown.” During the 1950’s and 60’s many artists moved downtown and opened their own exhibition spaces. Artists yearned to create art without being constrained by the concerns of uptown galleries. Uptown galleries defined the success of the work by how well it sold. Moving downtown facilitated experimentation and collaboration without a concern for a huge price tag. Spaces downtown were cheap. There was ample room for exhibition spaces, studios and an opportunity for artists to find solace in each other’s company – to share ideas, collaborate, influence each other without the nerve wracking consideration of whether to not the market would support those efforts. 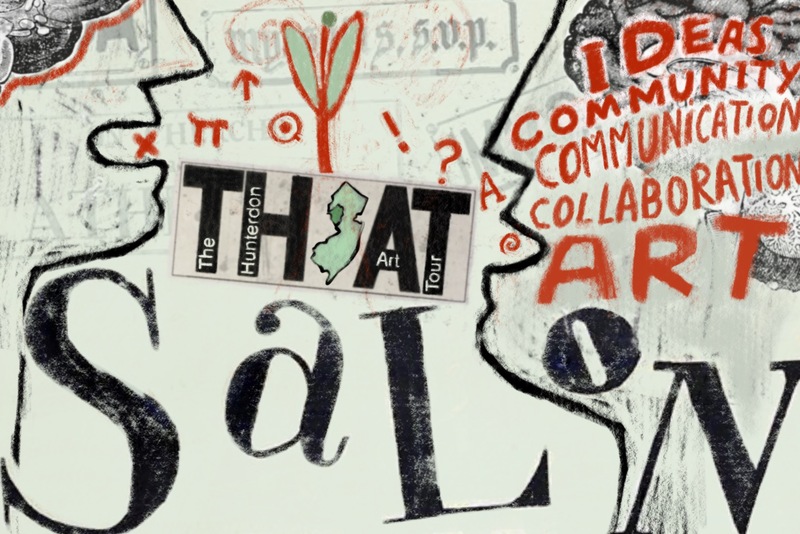 When community of artists swaps ideas, talks, connects regularly – Art Thrives! When artists can create without constraint, they are society’s vital sounding board – the most valuable role for any artist. Artists are our conscience – the eye and ears and voice for which society depends. Artists assist society in interpreting the times and find reason and answers and insight. I am saying CHEERS to us all! Taking this into our own hands will serve to empower our voices as artists. We are sprinting out of the gate! BRAVO! THIS IS A MANDATORY MEETING! If you cannot make it – PLEASE send someone in your stead. All changes to the website are FINAL after the 20th of April. Pick up your LAWN SIGNS. Share this as often as you can! Here’s how you do it!!! Be part of a group of 3 or more artists accepted into THAT in one location. The Deadline for Applying as as Artist for this Tour is FEBRUARY 15th! Twenty-one artists attended the public meeting on January 24th. The enthusiasm for THAT was palpable! opening night exhibit at the Hunterdon Art Museum. The size limit remains: no dimension greater than 30″. who want to show at one location! (Several groups of artists are already planning to participate together). and thus each artist will have a page on our web site. but each artist does not have a page on our website. To have a profile page on the site AND be a destination, the artists must each pay $35. Application plus $90. Upon acceptance. Sponsors and groups of artists who sign up to be a Destination will appear on the printed custom-made THAT map, which will be widely distributed in April, but you must sign up by the deadline of March 1, 2017. Sponsors and Destinations who sign up after March 1st will appear only our website. RE: Hunterdon Museum of ART Exhibition: We will NOT impose a price limitation on the piece that the participating artist chooses to submit. The scale will be limited to 30″ wide for wall work. Display options for Sculpture and other items will be worked out individually. 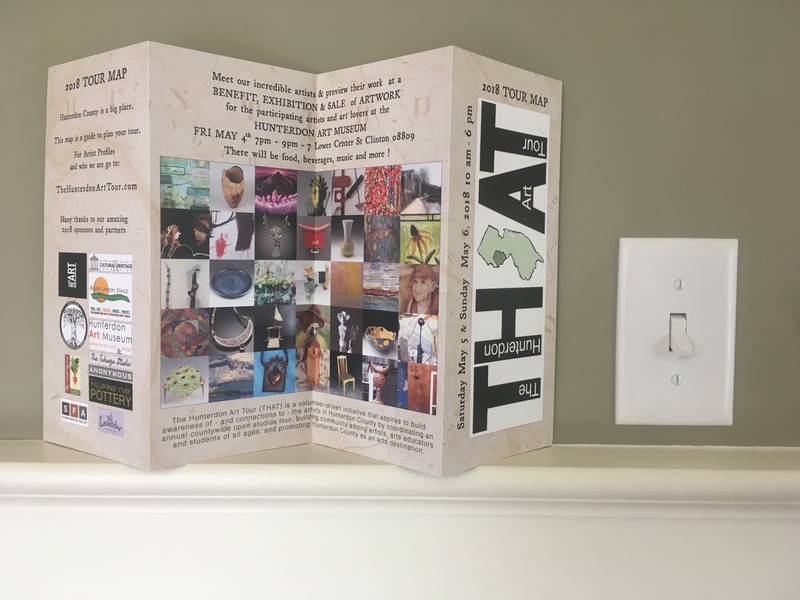 We are planning to create separate pull down menus for multiple artists exhibiting at one location : i.e: Toshiko Takaezu STUDIO, Prallsville Mills, Sunflower Studio – or others – as well as individual pages for each artist. Destinations do NOT get artists pages. Destinations will have a place on the MAP – both Printed (if $$ paid by March 1st) and DIGITAL (no deadline) – and a link to their website through the destination marker. \I’m sure there is more – but I gotta get back to that painting across the room! When: TUESDAY, JANUARY 24TH @ 7 p.m. Put it on your calendar!! Come with your ideas, your questions and anything else you would like to share. There’s a Lot to Announce! 1. THE ARTIST APPLICATION WILL BE AVAILABLE JANUARY 1st! We have created the ARTIST APPLICATION to PARTICIPATE in the Tour. The application period OPENS January 1, 2017. The application period ENDS January 31, 2017. TUESDAY: JANUARY 24TH @ 7 p.m. Put it on your calendar!! THAT: We are a new organization, learning as we go, and there’s a lot to learn! We benefit from the input we’re getting from you. Our aim in creating THAT was to establish an event that gave the artists in our county a chance to show off and sell their work directly to the public. We want THAT to be a place where artists who make their work and have demonstrated dedication to it can shine. We are curating the tour. We are curating the tour to ensure we have artists who fit that target group. This year the curators are the four of us, the people who formed this event. Three of us are visual artists, one is a writer. We are sensitive to the demands of putting art at the center of our lives and want to honor those who do. As a result from input, we are adding an option to THAT, the DESTINATION option. 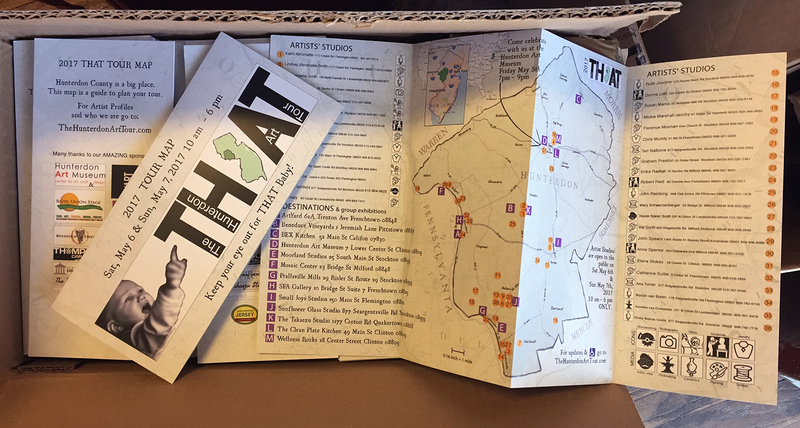 If you want your restaurant, gallery or other place of business (but not an artist’s studio) to be a DESTINATION on the THAT Map, you can! For a donation of $250.00 (or above) you will be listed as a DESTINATION. We are in the process of designing a printed map for the tour. Donate $250 or more and your DESTINATION will be on our printed and digital maps. 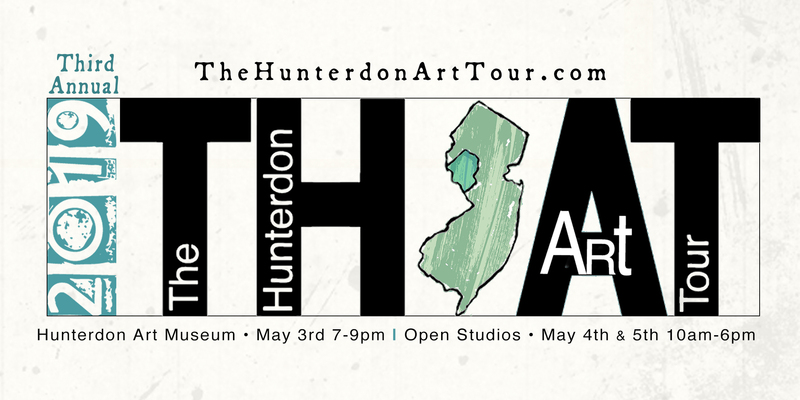 Put info@thehunterdonarttour.com in your address book. Check your spam folder if you’re reading this on our website or blog. Anyone want to share these babies? They need to go all over the county to generate involvement. Give us a shout. Send me an email and an address and I will bring some to you, or coordinate where you can pick some up. THAT has been having great momentum. We had a fruitful meeting this evening. THAT is asking you to spread the word about getting involved in the tour. Here are 3 ways the you can spread the word. Tell ARTISTS you may know. Send them a link to this BLOG. Have a Favorite Restaurant with great wall space… tell them they can be involved. How about Musicians? Saturday night will be a fabulous opportunity to perform around the county. Send them a link to this BLOG. Applications for PARTICIPATION in THAT opens Jan, 1 2017. For information regarding Participation, go to the PARTICIPATION link.